As a person breathes, the body consumes oxygen and produces carbon dioxide. Base metabolism requires about 0.25 L/min of oxygen from a breathing rate of about 6 L/min, and a fit person working hard may ventilate at a rate of 95 L/min but will only metabolise about 4 L/min of oxygen  The oxygen metabolised is generally about 4% to 5% of the inspired volume at normal atmospheric pressure, or about 20% of the available oxygen in the air at sea level. Exhaled air at sea level contains roughly 13.5% to 16% oxygen. However, if this is done without removing the carbon dioxide, it will rapidly build up in the recycled gas, resulting almost immediately in mild respiratory distress, and rapidly developing into further stages of hypercapnia, or carbon dioxide toxicity. A high ventilation rate is usually necessary to eliminate the metabolic product carbon dioxide (CO2). The breathing reflex is triggered by CO2 concentration in the blood, not by the oxygen concentration, so even a small buildup of CO2 in the inhaled gas quickly becomes intolerable; if a person tries to directly rebreathe their exhaled breathing gas, they will soon feel an acute sense of suffocation, so rebreathers must chemically remove the CO2 in a component known as a carbon dioxide scrubber. The first basic rebreather based on carbon dioxide absorption was patented in France in 1808 by Sieur Pierre-Marie Touboulic [fr] from Brest, a mechanic in Napoleon's Imperial Navy. This early rebreather design worked with an oxygen reservoir, the oxygen being delivered progressively by the diver and circulating in a closed circuit through a sponge soaked in limewater. Touboulic called his invention Ichtioandre (Greek for 'fish-man'). There is no evidence of a prototype having been manufactured. A prototype rebreather was built in 1849 by Pierre Aimable De Saint Simon Sicard, and in 1853 by Professor T. Schwann in Belgium. It had a large back mounted oxygen tank with working pressure of about 13.3 bar, and two scrubbers containing sponges soaked in a caustic soda solution. 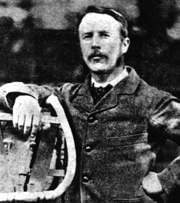 His apparatus was first used under operational conditions in 1880 by Alexander Lambert, the lead diver on the Severn Tunnel construction project, who was able to travel 1000 feet in the darkness to close several submerged sluice doors in the tunnel; this had defeated his best efforts with standard diving dress due to the danger of the air supply hose becoming fouled on submerged debris, and the strong water currents in the workings. During the Second World War, captured Italian frogmen's rebreathers influenced improved designs for British rebreathers. Many British frogmen's breathing sets used aircrew breathing oxygen cylinders salvaged from shot-down German Luftwaffe aircraft. The earliest of these breathing sets may have been modified Davis Submerged Escape Apparatus; their fullface masks were the type intended for the Siebe Gorman Salvus, but in later operations different designs were used, leading to a fullface mask with one big face window, at first circular or oval and later rectangular (mostly flat, but the sides curved back to allow better vision sideways). Early British frogman's rebreathers had rectangular counterlungs on the chest like Italian frogman's rebreathers, but later designs had a square recess in the top of the counterlung so it could extend further up toward the shoulders. In front they had a rubber collar that was clamped around the absorbent canister. Some British armed forces divers used bulky thick diving suits called Sladen suits; one version of it had a flip-up single faceplate for both eyes to let the user get binoculars to his eyes when on the surface. A major function of the closed circuit rebreather is to control the oxygen partial pressure in the loop and to warn the diver if it becomes dangerously low or high. Too low a concentration of oxygen results in hypoxia leading to unconsciousness and ultimately death. Too high a concentration of oxygen results in hyperoxia, leading to oxygen toxicity, a condition causing convulsions which can make the diver lose the mouthpiece when they occur underwater, and can lead to drowning. The monitoring system uses oxygen-sensitive electro-galvanic fuel cells to measure the partial pressure of oxygen in the loop. The partial pressure of oxygen in the loop can generally be controlled within reasonable tolerance of a fixed value. This set point is chosen to provide an acceptable risk of both long-term and acute oxygen toxicity, while minimizing the decompression requirements for the planned dive profile. If a full-face mask is used, it may have viewports designed for convenience or improved field of vision, and they do not need to be flat and parallel to prevent visual distortion as if underwater. Mountaineering rebreathers provide oxygen at a higher concentration than available from atmospheric air in a naturally hypoxic environment. They need to be lightweight and to be reliable in severe cold including not getting choked with deposited frost. Both chemical and compressed gas oxygen have been used in experimental closed-circuit oxygen systems – the first on Mt. Everest in 1938. A high rate of system failures due to extreme cold has not been solved. Breathing pure oxygen results in an elevated partial pressure of oxygen in the blood: a climber breathing pure oxygen at the summit of Mt. Everest has a greater oxygen partial pressure than breathing air at sea level. This results in being able to exert greater physical effort at altitude. The anaesthetic machine can also provide gas to ventilated patients who cannot breathe on their own. A waste gas scavenging system removes any gasses from the operating room to avoid environmental contamination. One of the functions of a space suit is to provide the wearer with breathing gas. This can be done via an umbilical from the life-support systems of the spacecraft or habitat, or from a primary life support system carried on the suit. Both of these systems involve rebreather technology as they both remove carbon dioxide from the breathing gas and add oxygen to compensate for oxygen used by the wearer. Space suits usually use oxygen rebreathers as this allows a lower pressure in the suit which gives the wearer better freedom of movement. (Submarines, undersea habitats, bomb shelters, space stations etc.) Living spaces occupied by several people over medium to long periods on a limited gas supply. These are equivalent to closed circuit rebreathers in principle, but generally rely on mechanical circulation of breathing gas through the scrubbers. Front mounted: When horizontal they are under greater hydrostatic pressure than the diver's lungs. Easier to inhale, harder to exhale. Back mounted: When horizontal they are under less hydrostatic pressure than the diver's lungs. The amount varies, as some are closer to the back than others. Harder to inhale, easier to exhale. The exhaled gases are directed through the chemical scrubber, a canister full of a suitable carbon dioxide absorbent such as a form of soda lime, which removes the carbon dioxide from the gas mixture and leaves the oxygen and other gases available for re-breathing. Some of the absorbent chemicals are produced in granular format for diving applications, such as Sofnolime, Dragersorb, or Sodasorb. Other systems use a prepackaged Reactive Plastic Curtain (RPC) based cartridge: The term Reactive Plastic Curtain was originally used to describe Micropore's absorbent curtains for emergency submarine use by the US Navy, and more recently RPC has been used to refer to their  Reactive Plastic Cartridges. The carbon dioxide passing through the scrubber absorbent is removed when it reacts with the absorbent in the canister; this chemical reaction is exothermic. This reaction occurs along a "front" which is a region across the flow of gas through the soda-lime in the canister. This front moves through the scrubber canister, from the gas input end to the gas output end, as the reaction consumes the active ingredients. This front would be a zone with a thickness depending on the grain size, reactivity, and gas flow velocity because the carbon dioxide in the gas going through the canister needs time to reach the surface of a grain of absorbent, and then time to penetrate to the middle of each grain of absorbent as the outside of the grain becomes exhausted. Eventually gas with remaining carbon dioxide will reach the far end of the canister and "breakthrough" will occur. After this the carbon dioxide content of the scrubbed gas will tend to rise as the effectiveness of the scrubber falls until it becomes noticeable to the user, then unbreathable. Closed circuit rebreathers usually allow the diver to add gas manually. In oxygen rebreathers this is just oxygen, but mixed gas rebreathers usually have a separate manual addition valve for oxygen and diluent, as either might be required to correct the composition of the loop mixture, either as the standard operating method for manually controlled CCRs, or as a backup system on electronically controlled CCRs. The manual diluent addition is sometimes by a purge button on the ADV. 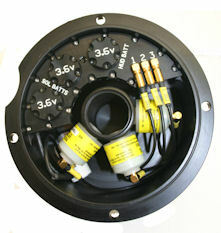 Most electronically controlled closed-circuit diving rebreathers have electro-galvanic oxygen sensors and electronic control circuits, which monitor the ppO2, injecting more oxygen if necessary and issuing an audible, visual and/or vibratory warning to the diver if the ppO2 reaches dangerously high or low levels. In the early Russian Epron-1 rebreather, the scrubber canister, the counterlung and the oxygen cylinder are parallel on the chest, from left to right, with the breathing tube loop from the end of the canister to the bag. When the gas mix is under pressure caused by depth, the inside of the canister is more crowded by other gas molecules (oxygen or diluent) and the carbon dioxide molecules are not so free to move around to reach the absorbent. In deep diving with a nitrox or other gas-mixture rebreather, the scrubber needs to be bigger than is needed for a shallow-water or industrial oxygen rebreather, because of this effect. Carbon dioxide absorbent, or sorb is caustic and can cause burns to the eyes, mucous membranes and skin. A mixture of water and absorbent occurs when the scrubber floods and depending on the chemicals used, can produce a chalky taste or a burning sensation if the contaminated water reaches the mouthpiece, which should prompt the diver to switch to an alternative source of breathing gas and rinse his or her mouth out with water. This is known to rebreather divers as a caustic cocktail. Many modern diving rebreather absorbents are designed not to produce this if they get wet. An indicating dye in the soda lime. It changes the colour of the soda lime after the active ingredient is consumed. For example, a rebreather absorbent called "Protosorb" supplied by Siebe Gorman had a red dye, which was said to go white when the absorbent was exhausted. Colour indicating dye was removed from US Navy fleet use in 1996 when it was suspected of releasing chemicals into the circuit. With a transparent canister, this may be able to show the position of the reaction "front". This is useful in dry open environments, but is not always useful on diving equipment, where the canister is usually out of sight of the user, e.g. inside the breathing bag or inside a backpack box. Temperature monitoring. As the reaction between carbon dioxide and soda lime is exothermic, temperature sensors, along the length of the scrubber can be used to measure the position of the front and therefore the estimated remaining life of the scrubber. While carbon dioxide gas sensors exist, such systems are not useful as a tool for monitoring scrubber life when underwater as the onset of scrubber "break through" occurs quite rapidly. Such systems should be used as an essential safety device to warn divers to bail off the loop immediately. In the British Navy the Carleton CDBA is (as at June 2007) planned to be superseded by the CDLSE "Clearance Divers' Life Support Equipment" made by Divex in Aberdeen in Scotland. It is an electronic closed circuit rebreather allowing diving to 60 metres (200 ft). 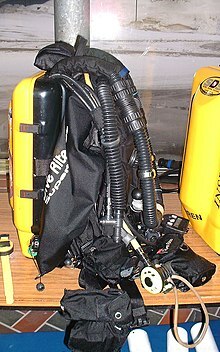 FROGS (Full Range Oxygen Gas System) manufactured by Aqualung is the frogman's oxygen rebreather which has been used in France since 15 October 2002:. Poseidon MkVI, the worlds first fully automatic closed circuit rebreather for recreational use, developed by Poseidon Diving Systems based on the Cis-Lunar MK5 design and further developed into the Poseidon SE7EN. Some military rebreathers (for example the US Navy MK-25 and the MK-16 mixed-gas rebreather), and the Phibian CCS50 and CCS100 rebreathers, were developed by Oceanic. (Stuart Clough of Undersea Technologies developed the Phibian's electronics package. The Savox was made by Siebe Gorman, It was an oxygen rebreather with a use duration of 45 minutes. It had no hard casing and was worn in front of the body. 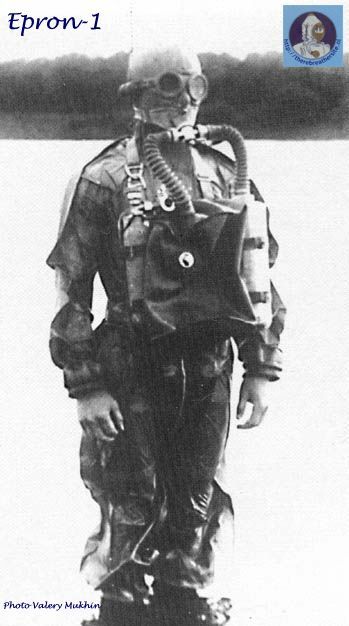 The "Universal" rebreather was a long-dive derivative of the Davis Submerged Escape Apparatus, intended to be used with the Sladen Suit. The current US Navy Mark 16 Mod 2 (Explosive Ordnance Disposal) and Mark 16 Mod 3 (Naval Special Warfare) units use the Juergensen Defense Corporation Mark V Control System. FROGS – Closed circuit oxygen diving rebreather Full Range Oxygen Gas System. ^ a b c US Navy Diving Manual 2016, Chapter 15 - Electronically Controlled Closed-Circuit Underwater Breathing Apparatus (EC-UBA) Diving, Section 15-2 Principles of operation. ^ James W. Miller, ed. (1979). "Fig 2.4". NOAA Diving Manual (2nd ed.). Washington, DC. : US Dept of Commerce - National Oceanographic and Atmospheric Administration. pp. 2–7. ^ Old French for "sir" or "Mister"
^ Bahuet, Eric (19 October 2003). "Avec ou sans bulles? (With or without bubbles)". La Plongée Souterrain (in French). plongeesout.com. Introduction. Retrieved 5 February 2017. ^ Bech, Janwillem. "Theodor Schwann". Retrieved 2008-02-23. ^ a b c d e Davis, RH (1955). Deep Diving and Submarine Operations (6th ed.). Tolworth, Surbiton, Surrey: Siebe Gorman & Company Ltd. p. 693. ^ a b c d e f g Quick, D. (1970). "A History Of Closed Circuit Oxygen Underwater Breathing Apparatus". Royal Australian Navy, School of Underwater Medicine. RANSUM-1-70. Retrieved 2009-03-03. ^ Paul Kemp (1990). The T-Class submarine – The Classic British Design. Arms and Armour. p. 105. ISBN 0-85368-958-X. ^ Bech, Janwillem (ed.). "Photos Draeger 1907 Rescue Apparatus". Retrieved 19 December 2017. ^ "Dräger diving helmets". Drägerwerk. www.divingheritage.com. Retrieved 12 December 2016. ^ Vann RD (2004). "Lambertsen and O2: beginnings of operational physiology". Undersea Hyperb Med. 31 (1): 21–31. PMID 15233157. Retrieved 2008-04-25. ^ a b Butler FK (2004). "Closed-circuit oxygen diving in the U.S. Navy". Undersea Hyperb Med. 31 (1): 3–20. PMID 15233156. Retrieved 2008-04-25. ^ Hawkins T (Jan–Mar 2000). "OSS Maritime". The Blast. 32 (1). ^ Older, P. (1969). "Theoretical Considerations in the Design of Closed Circuit Oxygen Rebreathing Equipment". Royal Australian Navy, School of Underwater Medicine. RANSUM-4-69. Retrieved 2008-06-14. ^ a b US Navy (2006). "Chapter 19: Closed-Circuit Oxygen UBA Diving". US Navy Diving Manual, 6th revision. United States: US Naval Sea Systems Command. p. 19-9. Retrieved 2008-06-15. ^ Elliott, David (1997). "Some limitations of semi-closed rebreathers". South Pacific Underwater Medicine Society Journal. 27 (1). ISSN 0813-1988. OCLC 16986801. Retrieved 2008-06-14. ^ Daucherty, RL; Franzini, JB (1977). Fluid Mechanics with Engineering Applications (7th ed.). Kogakusha: McGraw-Hill. pp. 257–261. ISBN 0-07-085144-1. ^ a b c Larsson, A. (2000). "The Interspiro DCSC". www.teknosofen.com. Retrieved 30 April 2013. ^ Shreeves, K & Richardson, D (2006). "Mixed-Gas Closed-Circuit Rebreathers: An Overview of Use in Sport Diving and Application to Deep Scientific Diving". In: Lang, MA and Smith, NE (eds.). Proceedings of Advanced Scientific Diving Workshop. Smithsonian Institution, Washington, DC. OCLC 70691158. Retrieved 2008-06-14. ^ a b Kelley, JS; Herron, JM; Dean, WW; Sundstrom, EB (1968). "Mechanical and Operational Tests of a Russian 'Superoxide' Rebreather". US Navy Experimental Diving Unit Technical Report. NEDU-Evaluation-11-68. Retrieved 2009-01-31. ^ Robinson, Brian. Taylor, Fionn (ed.). "Breathing Apparatus". Bob's History of Mining. Retrieved 27 December 2013. ^ Fischel, H. (1970). "Closed circuit cryogenic SCUBA". Equipment for the working diver - 1970 symposium. Washington, DC: Marine Technology Society: 229–244. ^ Cushman, L. (1979) [June 1969]. "Cryogenic Rebreather". Skin Diver magazine – via Aqua Corps magazine, N7, 28. ^ "Popular mechanics (ru), №7(81) June 2009". Retrieved 2009-07-17. ^ "Sportsmen-podvodnik journal, 1977" (PDF). Retrieved 2008-07-17. ^ a b staff (2003-08-18). "Breathing Circuit". University of Florida. Retrieved 2013-04-25. ^ Ravishankar, M. "Anesthesia breathing machines: an in-depth review". www.capnography.com. Archived from the original on 17 May 2013. Retrieved 30 April 2013. ^ staff (2003-08-18). "Mechanical and Manual Ventilation Systems". University of Florida. Retrieved 2013-04-25. ^ staff (2003-08-18). "The Scavenging System". University of Florida. Retrieved 2013-04-25. ^ staff (2011-02-14). "The Anesthesia Machine". University of Florida. Retrieved 2013-04-25. ^ Fischler IS, Kaschub CE, Lizdas DE, Lampotang S (2008). "Understanding of anesthesia machine function is enhanced with a transparent reality simulation". Simul Healthc. 3 (1): 26–32. doi:10.1097/SIH.0b013e31816366d3. PMID 19088639. Retrieved 2013-04-25. ^ a b "OC – DSV – BOV – FFM page". www.therebreathersite.nl. 8 November 2010. Retrieved 2010-12-29. ^ Reynolds, Glen Harlan (December 2006). "Seeking New Depths". Popular Mechanics. 183 (12): 58. ^ Norfleet, W & Horn, W (2003). "Carbon Dioxide Scrubbing Capabilities of Two New Non-Powered Technologies". US Naval Submarine Medical Research Center Technical Report. NSMRL-TR-1228. Retrieved 2008-06-13. ^ Bech, Janwillem (ed.). "Early Russian Epron-1 rebreather". Retrieved 19 December 2017. ^ Bech, Janwillem (ed.). "Photos Selbstretter Modell 180". Retrieved 19 December 2017. ^ Lillo RS, Ruby A, Gummin DD, Porter WR, Caldwell JM (March 1996). "Chemical safety of U.S. Navy Fleet soda lime". Undersea and Hyperbaric Medicine Journal. 23 (1): 43–53. PMID 8653065. Retrieved 2008-06-09. ^ a b Warkander, Dan E (2007). "Development of a scrubber gauge for closed-circuit diving". Undersea and Hyperbaric Medicine Abstract. 34. Retrieved 2008-04-25. ^ Staff. "Equipements des Commandos Marine" (in French). Archived from the original on 26 May 2013. Retrieved 11 October 2013. ^ Williams, Des. "Ted Eldred's Porpoise Oxygen Rebreather 1946". Historical Diving Times, No. 38 Winter 2006. Historical Diving Society. pp. 5–8. Retrieved 12 December 2016 – via www.therebreathersite.nl. Vann, R.D. ; Denoble, P.J. ; Pollock, N.W., eds. (2014). Rebreather Forum 3 Proceedings. AAUS / DAN / PADI: (PDF) (Report). Durham, North Carolina. ISBN 978-0-9800423-9-9. US Navy (1 December 2016). U.S. Navy Diving Manual Revision 7 SS521-AG-PRO-010 0910-LP-115-1921 (PDF). Washington, DC. : US Naval Sea Systems Command.